Protecting your home and withstanding all the weather elements is something your roof does each and every day. From the relentless ice and snow of winter to the scorching heat of summer your roof is the first line of defense for your home. Most roofs are designed to last for 15 to 30 years depending on the quality of the roofing materials. But there is something else to consider when you need roof repair or roof replacement in Fowlerville Michigan and that is the quality of the roofing contractor who does the roof repair or roof replacement in Fowlerville Michigan. At Livingston Roof Pros we go above and beyond the normal call for roofing contractors in this area. We’ve been part of this community for over 20 years and we plan to be here for decades to come. That’s why we take our job so seriously and customer service is at the top of the list. 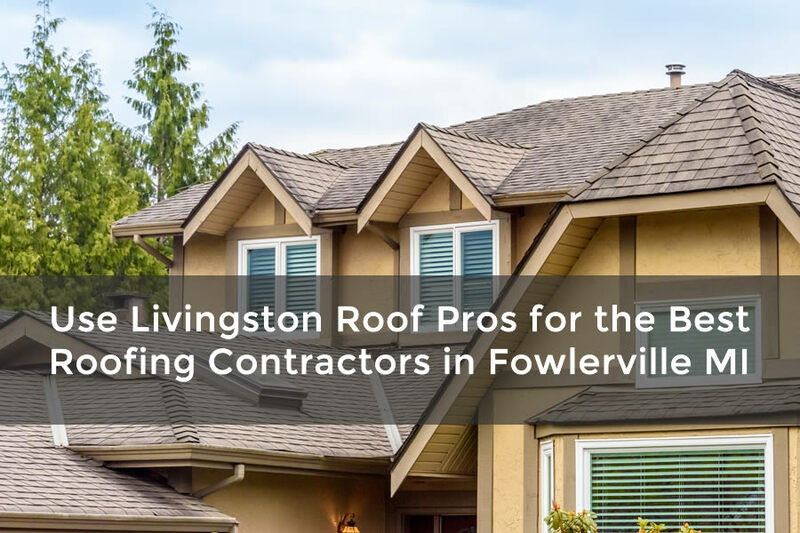 In this article I’ll discuss why Livingston Roof Pros is your best roofing contractor in Fowlerville Michigan and surrounding areas. Roof leaks can happen at any time for a variety of reasons. Although aging roofs are a common theme when a home needs roof repair or replacement there are other problems that may be present. Storm damage is another reason you may need to get roof repair on your home. At Livingston Roof Pros we offer both roof repair and roof replacement if needed. We’ll first consult with you on the exact problems with your roof and any options you may have with your roof. If you need roof replacement in Fowlerville Michigan we have options available for most home owners that can not only help save money on your home’s roof replacement but we may also be able to help with financing of your new roof. Call us today to speak with one of our customer service representatives about financing for your roofing project. For home owners that are needing an economical way to cover their homes with a new roof we do offer re-roofing service for qualifying homes. Your home must have a maximum of one layer of asphalt shingles installed to be eligible for a re-roofing project as Michigan building codes will not allow more than 2 layers of shingles on your home. We also have a tear off and replace option as well which can help you identify and repair any problem areas on your home’s roof. While we mainly focus on residential homes we also can help with roofing projects for small to medium commercial projects. We have experience in commercial roofing and are also qualified for a variety of roofing methods and materials when it comes to commercial roofing including flat roofing and metal roofing. For more information on commercial roofing projects be sure to speak with one of our customer service reps today. A huge problem that many home owners have when getting a new roof installed or getting roof repair done is that the roofing contractor in Fowlerville Michigan is not qualified or even licensed. This can cause all sorts of problems when it comes to warranty issues and coverage for your home. At Livingston Roof Pros we are a fully licensed and qualified roofing contractor in Fowlerville Michigan. We also hold many qualifications from roofing material manufacturers are well including the GAF Master Elite roofer status. When getting any type of roofing repair or roofing installation on your home make sure the roofing contractor is fully licensed and qualified or else you may be risking the warranty on your home’s roof. For more than 20 years we’ve been part of the community here in Fowlerville Michigan. We complete hundreds of roofing projects each year and we aim to make sure each and everyone of our customers is completely satisfied with our service. We have an excellent customer service record because of this. We’ve been part of this community for many years and will continue to offer our services to the great folks of Fowlerville Michigan. You may not need us today but if tomorrow you do, we’ll be here ready to help. Call us today for more information and to get a free estimate on your roofing project today.